Will X hit the spot? The new series is, sonically, now a match for any rival interfaces. If you’re tempted by the UAD ecosystem, this is highly recommended. Easy configuration of multiple Apollo devices. Universal Audio’s Apollo Range has become a major player within the crowded marketplace of audio interface design for two reasons. Firstly, the hardware offers a great sound, with clean, warm preamp design and interface options to let you match your needs to an appropriate hardware set. Secondly, the UAD brand has gone from strength to strength, with a wonderful and ever-expanding collection of plugins ready to be powered by the Apollo’s onboard processors. This hardware and software ecosystem has proven irresistible to many a producer, but it’s a competitive world out there and other manufacturers’ interfaces have stepped up recently. Not wanting the quality of its interfaces to compare unfavourably, Universal Audio has returned to its rackmount Apollo series and have now added four models in a new ‘Apollo X’ range. Three interfaces - the x8, the x8p and the x16 - are direct replacements for the previous Thunderbolt interfaces. The review unit is the x6, a new Apollo player, which neatly bridges the gap between the Apollo Twin and the ‘bigger brother’ Apollo X interfaces. Finished, like the rest of the ‘X’ series in an Apple-like brushed space grey colour, like the Apollo Twin, the Apollo x6 offers two Unison-ready mic preamps. Its I/O count goes higher, though, as it provides an additional four line inputs on the rear panel and a pair of Hi-Z connectors for guitars at the front. In terms of output, there is a main stereo pair and six more individual outputs, which can be configured for surround sound applications, should you wish. There are two headphone ports on the front panel, alongside controls which are largely doubled by the supporting Console software; changes you make to front panel settings are immediately implemented in the software and vice versa. Accordingly, you can engage phantom power, enable the pad, invert phase (and so on) on whichever control set is most convenient. In terms of digital connections, the x6 offers S/PDIF I/O, two optical I/O ports and word clock too. Much of that will be familiar to existing Apollo users but under the hood, much is new. Apollo x6 contains six DSP chips providing ‘HEXA Core’ processing, which in real terms means that the Apollo X interfaces offer 50% more processing power than their predecessors. This is significant if you’re intending to use more recent UAD plugins as Unison preamps across a multichannel recording; on my Quad-Core Apollo, running several of these can account for much of the total processing power available. But it’s not only the processing chips which have been upgraded; this Apollo’s specifications when it comes to audio interfacing are also pretty box office. Universal Audio has been back to the drawing board to upgrade Apollo X’s audio performance and it has done so by building new audio circuitry. The net result offers some impressive figures, including dynamic range of 122dB on the Mic Preamps, 123dB on the Line Inputs and 128dB on the Monitor Outputs. Sample rates are supported up to 192kHz but there are developments here too, as UA have adopted what it refers to as Dual-Crystal Clocking, which provides dedicated crystals for both 44.1kHz and 48kHz and their multiples (88.2kHz/176.4kHz and 86kHz/192kHz respectively), to reduce jitter. The other new interfaces in the Apollo X range are the x8, the x8p and the x16. Broadly speaking, these offer the same upgrades over their predecessors that the Apollo x6 provides - ‘HEXA Core’ processing for more DSP power and improved audio performance. However, whereas the Apollo x6 offers surround monitoring up to 5.1, the increased output spec of these larger Apollo X interfaces means that systems up to 7.1 are supported. Across the entire range, the output volume control has been switched to a digital design and it’s also worth noting that while connectivity is still via Thunderbolt (Thunderbolt 3), the connector is a USB-C type. This means you’ll need to buy a Thunderbolt cable and an adaptor. Neither are provided - the only Apollo X failing. To state the obvious, the Apollo X series will appeal most to those not only drawn to the high quality of audio interfacing but also to the UAD ecosystem. To that end, the Apollo x6 ships with UAD’s Realtime Analog Classics Plus Bundle, which includes a host of plugins available both for tracking purposes and/or at the mix stage. 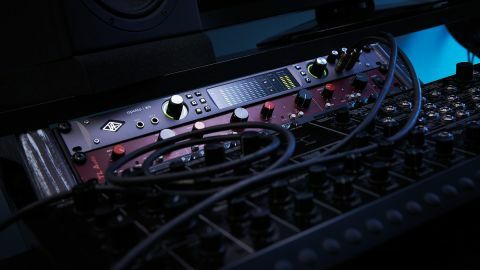 These include channel strips, mic pre-emulations, amplifier clones, spatial processors and effects pedals and while some of the biggest names to be associated with the UAD platform are absent there’s still a great collection of processors here. The software capabilities of the Apollo universe go further - whether your system is limited to a single interface or is maxed out, the Console control software is ready to respond. Console is where individual input channels can be configured with Unison pres and where users set whether to use additional UAD plugins for monitoring or recording purposes. The Master section controls Monitor output levels (including any surround configuration preferences now too), while auxiliaries let you configure monitor reverb effects for performers, for example. Console automatically upscales its channel count depending on rig size, so everything is neatly joined up. In fact, the Apollo X interfaces would be highly competitive interfaces in their price range(s), even without the call of class-leading effects hosting. All of the crucial audio performance numbers have been significantly enhanced, while the new processing chips allow for multichannel recording through Unison plugins without feeling that you’ve already cashed in all of the onboard effects capacity. Add in new surround sound provision and Apollo X adds up to a hugely attractive audio interfacing package. If you’re attracted by the UAD concept, there’s never been a better time to jump onboard with Apollo, particularly as the x6 offers as much I/O as many users will need - at a great price.